One of the key parts of the Fleep email integration is that you can create email conversations. Now, we’re happy to share that we have added on the feature of email list behavior. Over time, we have done our best to map incoming emails to the right Fleep conversations. However, conceptually email threads don’t carry a universal way of grouping emails into a conversation. It can be done by members, by subject or some other indicator. Fleep is conversation-centric, which means we group emails together by membership. In the context of how Fleep interoperates with email, this means that every time an email participant adds or removes someone from the thread of emails, this creates a new conversation for Fleep users. We have built email list behavior for Fleep conversations to improve this experience. With email list behavior, Fleep conversations that have email participants behave in a clear and predictable way. This means all members of the list receive the messages, and all replies flow back to the right conversation for Fleep users. In fact, email lists are the closest thing to a messenger-like conversation in the email world, where participants join the list, leave the list, and reply to the list. As such, email list behavior improves the Fleep email integration quite a bit, by making the experience more clear and predictable for everyone. In short, when email list behavior is enabled for a conversation, then the conversation acts like an email list to email participants. When email list behavior is disabled, the conversation acts as a normal email thread to email participants. Email user sees the message sent from Fleep as a message in an email list, where the Fleep conversation email acts as the list email address. Email replies are posted in the original conversation, regardless if email participants hit Reply or Reply All. So it’s foolproof – all replies are sent to the whole list, as the list address is the Reply-To address. Without email list behavior, hitting Reply to a group thread breaks the thread, and likely creates a new conversation for the Fleep users. Better message grouping for email users. 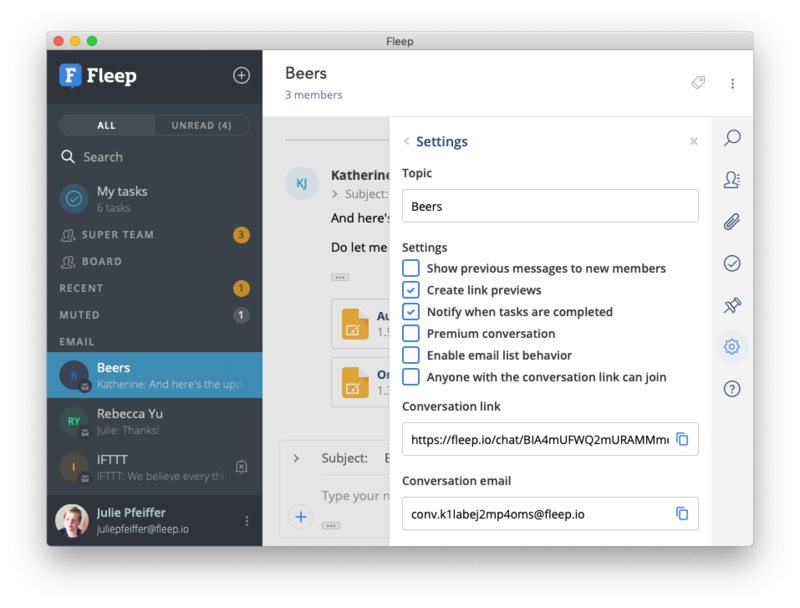 When email list behavior is enabled, Fleep attaches information to email’s technical header that helps email clients group the list emails into one thread. How to enable or disable email list behavior? You can configure the setting with the “Enable email list behavior” setting that is visible in email conversations. Email list behavior is the latest addition to Fleep’s functionality. We hope you make use of it and enjoy the Fleep email integration even more than before. Have any questions or feedback for us? Contact us at support@fleep.io. Let’s also stay in touch through our social media channels - Twitter, Facebook, LinkedIn.